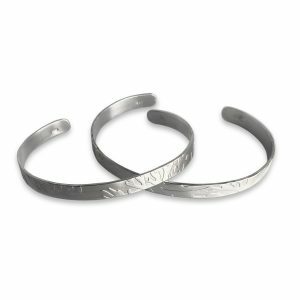 Light and comfortable sterling silver cuff with a subtle coral texture. Made in 18 gauge sterling silver, textured and polished with a satin finish and comfortable softly rounded edges. This bracelet fits a medium to large woman’s wrist. 1/4″ wide. This listing is for the medium size cuff which is the bottom bracelet in the photo.